Today was Day #6 of Chocolate and Gluten-Free Cookie Theme Week. Nature's Best (Brea, CA) is one of the largest privately owned wholesaler-distributors of health foods in the Americas. 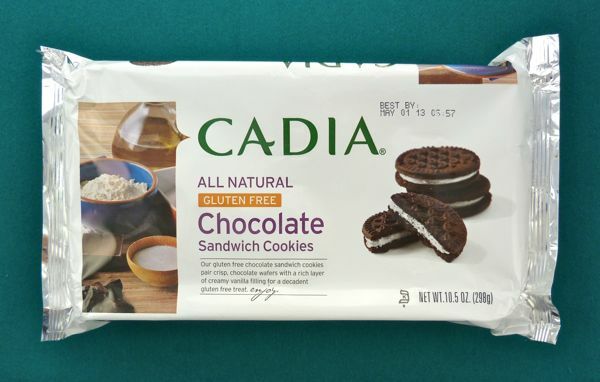 Their Cadia product line can be found in an increasing number of independent grocery stores, and small chains, such as Piazza's Fine Foods, where I found these chocolate sandwich cookies. Similar to Nabisco Oreo sandwich cookies, these cookies (from Canada) weren't marked organic (many of the company's products are); however, they were gluten-free. 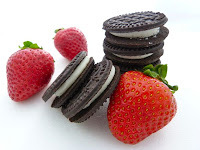 So, I was able to enjoy two of these crisp chocolate wafer style cookies with the vanilla cream middle, reminiscent of childhood. Did I unscrew the two chocolate cookies so I could eat the cream center? No, that would be playing with my food. Instead I engaged in some dessert landscaping. I crushed one of the sandwich cookies -- transforming it into chocolate dirt -- and packed this sugary soil into an orange, plastic shotglass flowerpot. 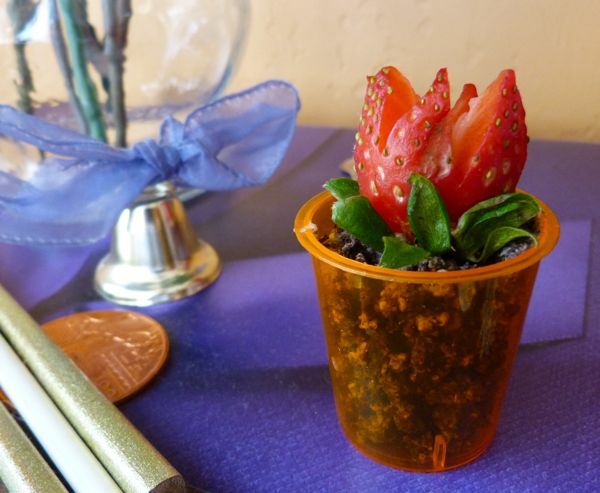 With the help of a paring knife, a strawberry became a flower in this pot. Et voila, a shotglass dessert with only 75 calories. Chocolate gardening should be fun.